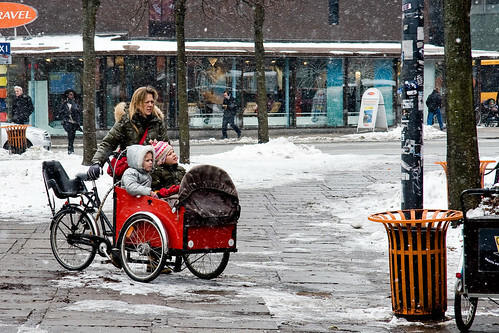 Outside a cinema during the winter holidays a mother rolls up with her kids in a classic Copenhagen cargo bike. 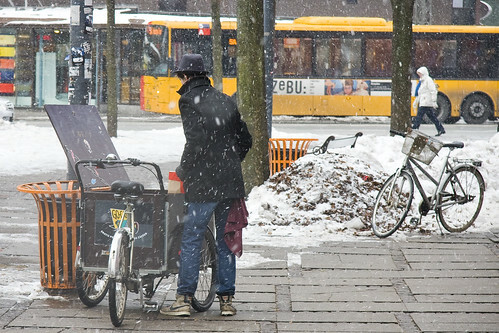 Not far from there this dapper chap is distributing the free postcards you see at many cafés, using another cargo bike. Very cool pictures, I love the red cargo box, I would love one! AND room for another baby on the back - supermommy indeed!! Look at the children. They are cold, miserable and bored. They would be cosy and happier in the back of a large family 4x4, with a DVD or Nintendo DS to entertain them, perhaps with an educationally positive program from Disney. The mother is selfishly depriving these children of comfort and education in the pursuit of her own fitness. Will the snow never end ? I wonder what the one in the knit hat is looking at? One of the bills on the pole, or maybe something interesting in the tree? That's one nice advantage of the cab in the front of the cargo bikes: you can take in everything that's coming up toward you and slipping by. Sitting in a bike trailer, you basically get to stare at the parental caboose and get last moment glimpses of anything more interesting as it whizzes by on the sides. Nothing to do with the bike, but those are quite pretty waste baskets. Love the red bike! Great photo. Wish it was more accessible to purchase these cargo bikes in the U.S.